Young English photographer Nick Willis is having his first photographic exhibition, even though he has been photographing for 14 years, and his debut is in Chiang Mai. 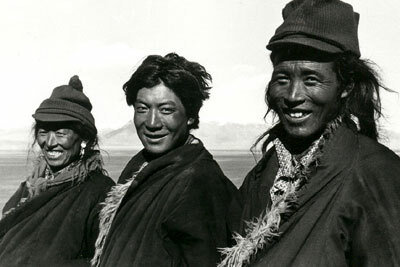 To be held at the Darling Pub opposite the Amari Rincome Hotel, the images are in two groups - Colour and Black and White, with the subject being an extended visit Nick has had to Tibet. Young English photographer Nick Willis is making his photographic exhibition debut at the Darling Pub December 29 - January 5. Freely acknowledging his interest in Tibet, which stemmed originally from inspiration engendered by the Dali Lama, Nick is hoping to bring a little of the culture of the Tibetan people to the viewers of his photographs. In his quest to find the ‘real’ inhabitants of this isolated country, it meant many days of trekking and hitchhiking, and he was even arrested and forced to pay a fine to the Chinese police for having strayed into ‘forbidden’ territory at one stage. The exhibition will run from 29th December until the 5th of January 2003, and prints will be on sale. The crowds began building by 9:30 a.m., even though the annual charity fundraiser wouldn’t open until 11 a.m., and excitement filled the air. 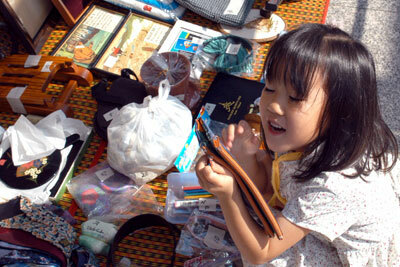 It was time for the Nihonjin Kai, or Chiang Mai’s Japanese Woman’s Association’s Annual Bazaar! Not only great bargains, but the money raised goes to charity. This flea market, held every December, is run by the woman’s group and donates the moneys raised to the Red Cross, the Disabled Center, and various orphanages in Thailand, while offering great bargains to all who attend. The space for the bazaar was provided by “The Kitchen Hash” Japanese restaurant in Chiang Mai, owned by Mr. and Mrs. Fujita, and is an excellent place to dine when in the mood for a great Japanese meal served in traditional manner. All of the merchandise on sale is donated by the various families belonging to the Japanese Association members, and is as varied as books to golf clubs, new Zebra brand cooking pots to antiques furniture and new and used clothing. This reporter was on hand for the event and came away with a few treasures of his own! From the looks of things, a good time and some great bargains were had by all. 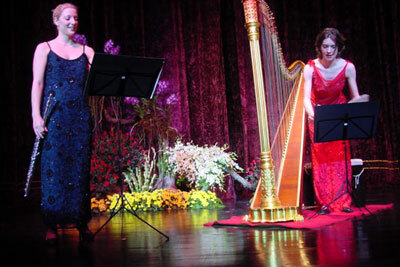 Catrin Finch, royal harpist to HRH the Prince of Wales, together with British flautist Juliette Bausor recently came to Thailand for 2 concerts. Ms. Finch played Thailand’s first harp, a 1916 Morley’s Grand Concert harp, which once belonged to HRH Prince Chudadhuj. Both concerts were a terrific experience, and a huge success. Those who attended the concert had a wonderful evening, and one would wish there were more concerts like this here in Chiang Mai. 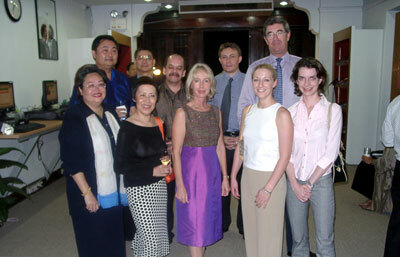 HE British Ambassador to Thailand Lloyd Barnaby Smith (back row, right) was delighted to host a reception to welcome the artists on the eve of their highly praised Harp and Flute Duo Concert. The two young ladies (22/23) played very well together, and especially the ‘Sonata for flute and harp’ by Arnold Bax, which was beautifully performed by both artists. What Finch can do with a harp is amazing. She gives this beautiful instrument a completely new meaning. It doesn’t matter if it was Debussy’s ‘Clair de Lune’, or ‘Histoire du tango’ from Astor Piazolla, or some Welsh melodies, or the impressive ‘Santa Fe Suite’ of William Mathias. It was all played so well which such a great skill. Saturday, December 14, at 10:30 a.m. was the official opening of Ruam Mit Caf้ and Bakery. Behind the Ruam Mit Caf้ stands the Ruam Mit Foundation, a vocational and life-skills program for young recovering substance users and youth at risk. Cutting the bread-ribbon (from left to right) are Nit Wangviwat, Hon. Consul for Canada, Christine Munro, Canada Fund Coordinator, Dr. Jaroon Jittiwutikarn, Ruam Mit’s director, and Hagen Dirksen, Hon. Consul for Germany. As His Majesty the King said in his birthday speech on December 5, Drug Abuse is widely spread in this country, and it troubles him a lot. So society must do everything it can to help overcome this problem and let socially challenged people not be a burden but a helping hand in our society. That is exactly what the Ruam Mit Foundation is doing. Their experience is that substance abusers and people belonging to families with substance abusers are already at high risk without counseling and help. Many get caught in the cycle of physiological and psychological addiction. Some are thrown in prison. Some have the chance to get treatment, but going back to the same circle of people makes it even harder to resist. Many young users also find it difficult to find employment due to lack of skills and being frustrated; being out of a job makes it just so easy to go back using drugs. In August 2000 Ruam Mit started providing economic and social rehabilitation services as a community development response for young adolescents. Currently, this training is centered around baking and marketing with the main program teaching the kids how to bake whole-wheat bread, cookies, and many other kinds of goodies, with an emphasis on health food. One can already anticipate the cozy atmosphere from the outside. 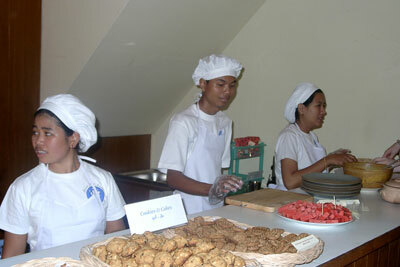 The bakery team consists of a trainer-baker and up to 8 trainees at a given time. 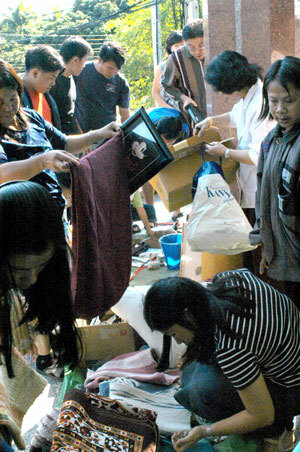 The goods are sold by direct delivery service to individuals and shops, guesthouses and department stores around Chiang Mai. Customers can order online, by telephone or by fax. At the end of the 6 months training, the successful young bakers receive a certificate to show their credibility to operate independently either within this bakery or gain employment outside. Health food is emphasized - three of the trainees bake cookies, various breads and pizzas, and many items are for sale at local supermarkets. Apart from running the business, Ruam Mit also provides opportunities for non-formal education by regularly inviting resource persons to hold workshops for the trainees about drug prevention, personal development, recreation, health (especially AIDS awareness) and provides basic computer skills training. The trainees come from lowland and upland Thai communities and are between 13 - 25 years of age. Currently, 5 young recovering substance abusers and 3 youths at risk are going through this program with as much enthusiasm as you can imagine. Finally they have been given a chance they could only dream of in their former life. They have a clean place to sleep, a place to work, they are encouraged to play music and sports, they grow vegetables and herbs, they learn to socialize and all this builds up their self-confidence, their acceptance and respect towards each other. And it shows as you can see when you walk into the caf้. Smiling faces greet you, along with the aromas of cookies, freshly baked bread, pizza and coffee. After the youths successfully go through the program and receive their certificate, they return to their communities. Ruam Mit supports its alumni by offering financial/technical assistance and regularly follows up on their progress. To give you an example: One of the first trainees of Ruam Mit has established a small but successful Thai sweets business in Chiang Rai, built from a 9000 baht interest-free loan. 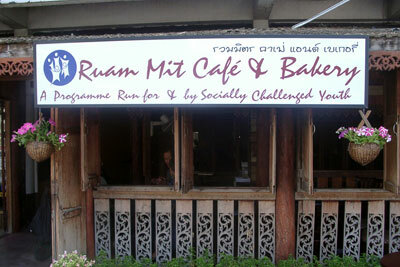 At the opening of the Ruam Mit Bakery, which is located next to the TAT office on Chiangmai-Lampoon Road, right across the small iron bridge, Hagen Dirksen, honorary consul of the Federal Republic of Germany, Nit Wangviwat, honorary consul of Canada, and Christine Munro, Canada Fund coordinator, presided over the ceremony. Mrs. Christine, a very sympathetic lady who came all the way from Bangkok for the opening, added in her speech that the government of Canada has supported more than 1000 NGO small projects during the last 27 years and is very happy to add the Ruam Mit Foundation, not only because this project has a long term lifespan but also because their work is just ‘delicious’.